Namibia and South Africa are each to be allowed to kill and export five black rhinoceros per year. The Convention on International Trade in Endangered Species (Cites) will also allow the two nations to increase their exports of leopard products. The decisions, made at Cites' biennial meeting in Bangkok, have disappointed some conservation groups. But Namibia and South Africa insist the money raised from the sales will help pay for improved conservation efforts. 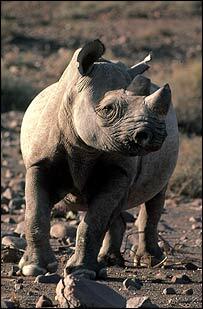 The black rhino had been on the decline since the 1970s due to hunting, war and increasing demand for land. It suffered a near-catastrophic decline from about 65,000 animals in the 1970s to only 2,400 in the mid-1990s. Poachers sought rhino horn because of the high prices it fetched in the traditional medicine markets of the Far East. In the Middle East, the horn has also traditionally been carved and polished to make dagger handles. But according to a major study released earlier this year, numbers in southern Africa have risen by around 40% over the last decade. As a result, South Africa and Namibia believe the time is right to introduce very limited hunting - and as big game hunting is an international affair, this means they need the export of trophies to become legal. Each country will be allowed to export products from five animals only each year, and they must all be elderly males. The application was supported by the scientists and technocrats of the Cites Secretariat, who believe that taking elderly males can actually help herds to expand. "It's important to realise that black rhinos are on Appendix I and they are staying on Appendix I; their status has not changed," Michael Williams, spokesman for United Nations Environment Programme, told the BBC. Appendix I is the classification used by the convention for species most at risk; trade in these creatures is permitted only under exceptional circumstances. The thousands of dollars that trophy hunters will have to pay to take down a black rhino will also be put back into conservation programmes, say Namibia and South Africa. Delegates will have to give approval at the plenary session at the end of the two-week summit. Environmental groups profess themselves disappointed. WWF, the global conservation programme, for example, expressed doubts about procedures intended to ensure that only the designated animals - the elderly males - would be hunted. "WWF spoke at the meeting and expressed concern that South Africa does not have adequate management and control mechanisms in place to allow for trophy hunting of black rhinos," the organisation said in a statement. "There are still weaknesses within South Africa's internal control of white rhino trophy hunting. WWF is not convinced that the money generated from the potential income will benefit local communities. "We do not believe that the selection process for choosing the adult male rhinos to be hunted will be based on rigorous and scientific criteria." On Namibia's proposal to allow an export quota of five black rhinos as hunting trophies, WWF said it would have preferred a more precautionary approach. This would have allowed for a maximum of two rhinos, and other controls. Cites delegates also decided to increase the export of leopard trophies from Namibia and South Africa from 175 up to 400, again acknowledging that conservation efforts have been so successful that hunting can sustainably increase. This is the first time the 166 member-states of Cites have met in Asia. It is the 13th meeting of its kind. Delegates must decide the degree to which rare animals and plants can be exploited commercially. They have some 50 proposals to work through, including setting limits on trade in species such as the great white shark, the ramin timber tree, and African and Asian elephants.